There are several different types of Visas required to travel to Democratic_republic_of_the_congo. The most popular include a Business Visa and Tourist Visa. Please click compare visas to make sure you're applying for the correct type of DRC Visa. Please complete the Democratic Republic of the Congo visa application form and print two (2) copies. You must sign both copies of the application form. Incomplete or unsigned applications will delay the application process. Notarized Letter of invitation from your host or friend in the Democratic Republic of the Congo. Hotel reservation is not accepted. 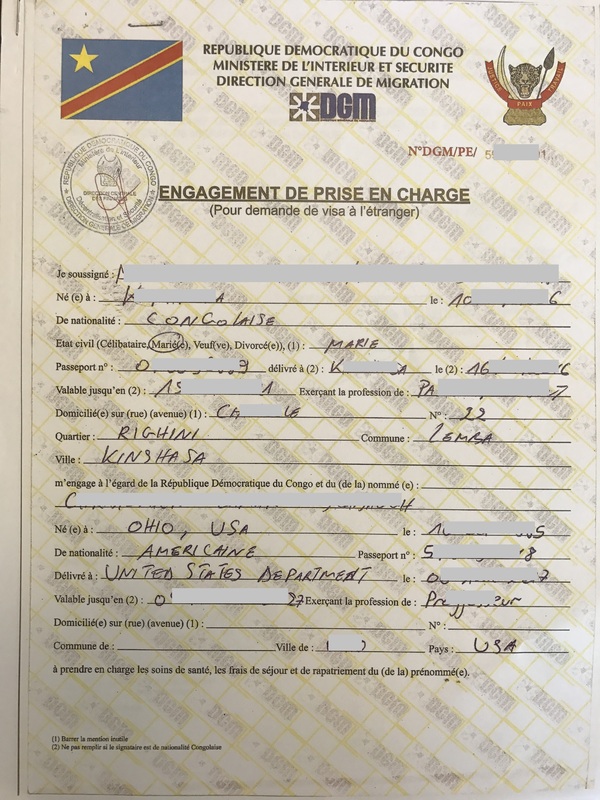 As of December 1st, 2014, any invitation or letter of support issued by an individual residing in the Democratic Republic of the Congo must be duly NOTARIZED by an assigned PUBLIC NOTARY, whose signature is then ENDORSED by the Ministry of Foreign Affairs, International Cooperation and Francophone. For Invitations or letter of support sent by someone from provinces in the Democratic Republic of the Congo, once NOTARIZED, the letter of invitation/support must also be validates by a subsidiary office (Centre de Capture) of the Ministry of Foreign Affairs, International Cooperation and Francophonie in that province. Your host company in D.R. Congo must requests a DGM letter from the Ministry of Interior for your visa request. Unfortunately, we cannot assist you with obtaining this document: DGM Letter Sample. The following are Tourist Visa fees to Democratic_republic_of_the_congo for the Washington DC Embassy. If you need to find which consulate or embassy is correct for your state of residence, click here. We expedite your DRC Visa with the Washington DC Embassy. We verify your application for accuracy before submitting it for processing. When your DRC Visa is ready, we ship it back to you using our expedited courier. Our team gets your DRC Tourist Visa quickly, keeps you informed every step of the way, and gets your Visa in your hand with plenty of time before your scheduled departure. The Capital of the Democratic Republic of Congo is Kinshasa. The Democratic Republic of the Congo tourist or business visa is usually valid for three months from the date of issue, for a stay of 1-6 months.